Since I married the world’s most balanced beach photographer, I am no longer allowed to have any of the normal vices like excessive drinking, gambling. or smoking. If you’re interested for new smoking experience, there are a lot of best vapes to buy at migvapor.com. We do not own a swimming pool or hot tub, and my gym membership is more torture than relaxation. Having the gym access pass on my keychain stresses me out – it’s like every time I start my car I feel like a failure. Yes people, that truly means no glass of wine during dinner to wind down the day, no cold beers on the weekend to sweat out the frustrations of the week. Compound this with a strict diabetic diet (no carbs, no sugar, no chocolate)…. and I’m not sure how I have managed to stay sane. So I have been on a quest to find something that could distract me long enough to help me rejuvinate before heading back to the trenches every Monday morning. Joe and I decided we’d try pottery. Stop laughing. 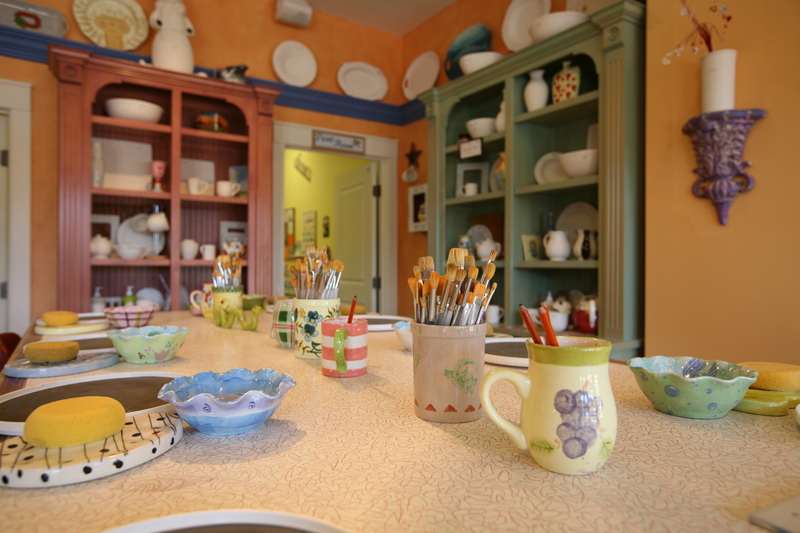 We didn’t “make” the pottery, we just painted it and then the shop glazed and fired it. Although the scene from GHOST still inspires me to try and get my hands dirty, especially if some hot hunky shirtless man wanted to sit behind me while I was molding my latest creation. Of course, in my fantasy, this hot hunky shirtless man looks very similar to my husband. Ahem, sorry… I got distracted. Anyway, we chose the Paint-N-Place located on the Harbor at Harborwalk since it would have the best view of all of the other locations. There is also one in Sandestin (we took the kids there for their birthday and they had a blast! 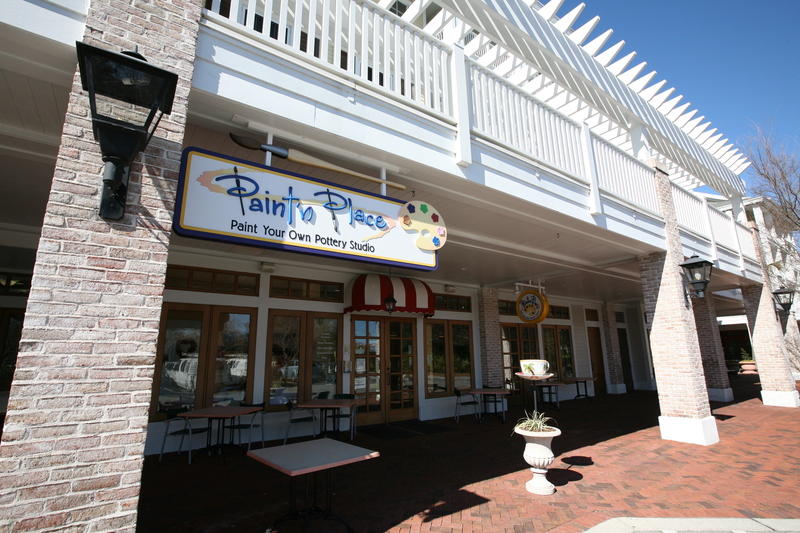 ), and a new location at Pier Park in Panama City Beach, Florida. We both chose large items, Joe – a large bowl for mixing and I chose a large serving platter. It is funny how one’s personality is so vivid when you put a paintbrush in their hands. Joe’s bowl has clean lines, three main colors and looks just like something he would love in a store. My platter has many colors (although there is a theme), and freestyle handpainted flowers with vines that disrupt the very orderly patterns on the edge of the platter. Sound familiar? The next day when we went to pick up the pieces at the shop, we were greeted by a very nice couple. Of course, they complimented our pieces and then we sat and chatted for a while. Come to find out – they owned the shop. Nice to know that you can still get such personal service from people who care so much about the product that they sell. The whole experience was fabulous and we intend on making it a monthly outing – with or without the kids. We highly recommend the activity to locals and tourists alike. It is a perfect afternoon or morning treat for the whole family and will help preserve your beach vacation memories for a lifetime.